Peter Clarke, the Chief Inspector of Prisons for England and Wales, has delivered yet another devastatingly damning report on the state of prison conditions in this country. In a series of reports into the shockingly dreadful conditions prevalent in jails, he has been bluntly truthful. In each of his reports he has brought into the light of day the overcrowding, escalating violence, rampant drug abuse and frequency of suicides that characterise English prisons. His most recent report, made after an unannounced inspection at the main prison in Birmingham, is no exception. During his visit Mr Clarke found “a state of crisis remarkable even by the low standards … in recent years”. Wardens at the prison, which was outsourced to the notorious private security group G4, were found to be in “tenuous control”. During the inspection, staff vehicles were torched in an arson attack. The entire place was infested with rats and cockroaches, with windows broken, and all-pervading violence as intimidating as in any jail in Britain. How widespread is the drug use may be gauged from the fact that Mr Clarke inadvertently got high from breathing in the atmosphere, according to his report. The Chief Inspector concluded his report by the observation that he placed no confidence in the prison’s ability to make any improvement whatsoever. That is in line with the findings of his annual 2017-2018 report into the overall state of affairs in British prisons, in which he singled out the recurrent failure of the powers that be to act on previous recommendations. The Birmingham prison is a case in point, where 260 prisoners participated in a 12-hour riot in 2016 – an incident that went unheeded. 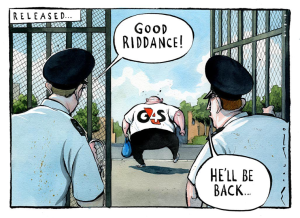 Following the Birmingham report, this time the government has been compelled to strip G4S of its authority over this prison, one of the largest in Britain, and has assumed direct control. This follows hot on the heels of the failure of some privatised rail franchises, the collapse of private works and the construction company Carillion. The Birmingham prison report has yet again served to focus public attention on the issue of the outsourcing and privatisation of public services and utilities. The British people have always been suspicious of, and uneasy about, the idea of private jailers. 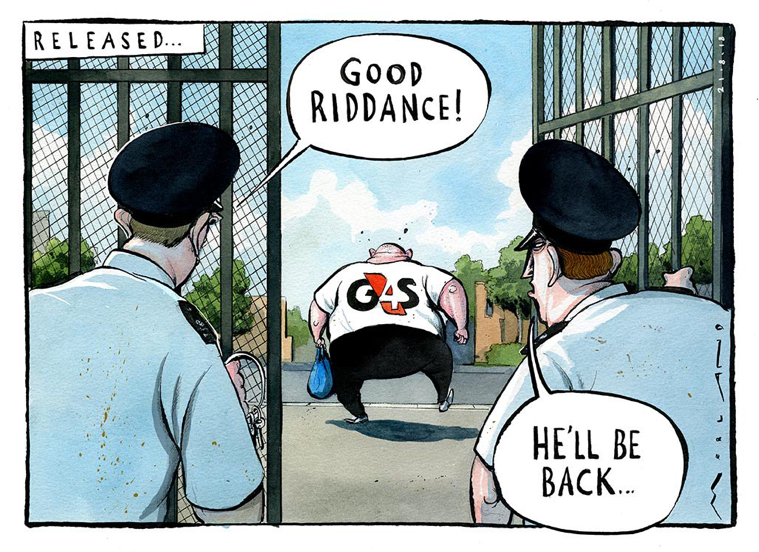 G4S is one of a group of three main corporations which have grabbed the opportunities offered by successive governments – Labour and Tory – through their policy of privatising jails since 1992. G4S was investigated in 2013 for overcharging for tagging criminals. In 2015, the education watchdog Ofsted found that it was guilty of subjecting youths at a secure training centre near Rugby to “degrading treatment”. In 2017, a BBC documentary unearthed the shocking conditions at an immigration removal centre operated by G4S. The latest report into troubles at Birmingham is further proof, if such proof were needed, of the inability of the likes of G4S to run public institutions. The misery implicated by the extension of privatisation into the area of jails comes on top of the explosion in the prison population, which has doubled to more than 80,000 since 1993, directly in response to government policy. In that year, the then Conservative Home Secretary, Michael Howard, initiated aggressive jail sentencing guidelines, which were not matched by increased capacity to accommodate a larger influx of prisoners. In addition, austerity measures following the near-meltdown of the imperialist financial edifice, have taken their toll in the jails sector, as reflected in a decrease in the number of staff, which has a direct bearing on questions of safety in jails. Even the Financial Times felt compelled to observe in this regard that instead of “doubling down on Lord Howard’s flawed doctrine that ‘prison works’,” Theresa May’s government should follow the trail blazed by Scotland “by reducing the number of inmates on sentences below 12 months, often for drug-related crimes, and bringing back more community service” (Editorial, ‘A shocking indictment of a privately run UK jail’, 21 August 2018). The light shone by Mr Clarke’s report into our prison administration brings out the inhumanity and cruelty to which our ruling class subjects mostly the victims of its own system, in which poverty, destitution, homelessness, unemployment, drug use and abuse, mental illness and crime flourish with tropical luxuriance. And the bourgeoisie’s stock answer is to lock up those deemed to be in violation of the law in unhygienic and draconian prisons, within which to practise on these victims harsh treatment with sadistic pleasure. And this gentry, and its ideologues, have the chutzpah to indulge in malicious propaganda against the prison system in the erstwhile Soviet Union, which was the most humane, with an emphasis on reform rather than vengeance and retribution. If Mr Clarke’s reports serve to stop dead in the their tracks all attempts to institute in Britain the American-style prison-industrial-financial nexus, which thrives on ever-increasing criminalisation augmenting the prison population, and which brings fabulous profits to private jailers, they would have rendered an undying service to the British working class. Be it said in closing that what applies to privatisation of jails applies, with the necessary modifications, to all other areas of privatisation, such as health, education, railways and public utilities. The entire racket, designed to rip off the taxpayer, should be put an end to with immediate effect.